Excessive growth hormone may lead to gigantism in children and acromegaly in adults. Children with gigantism may present with tall stature that occur before epiphyseal closure. 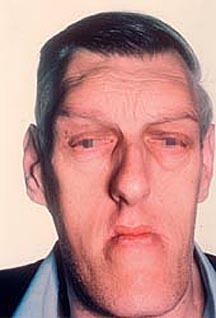 Acromegaly in adult may present with collection of signs and symptoms such as feet and hand enlargement, gain in weight, cardiomegaly, changes in the facial features, hyperglycemia/ insulin resistance, hypertension and cardiac failure as well as bitemporal hemianopia due to compression of the optic chiasm. Excessive secretion of growth hormone may stimulate the excessive secretion of the insulin like growth factor from the liver. The common cause of acromegaly and gigantism is the growth of pituitary somatotrophic adenoma. This pituitary somatotrophic adenoma may present with multiple acidophilic cells. There are also secretory granules which secreting growth hormone. The treatment may include surgical removal of the pituitary adenoma and the usage of somatostatin analogue / octreotide which will decrease the secretion of the growth hormone.